But the Insight guide that the Discovery Channel published called it strange and exotic. We’ll take a closer look at it and delve into its mysteries. 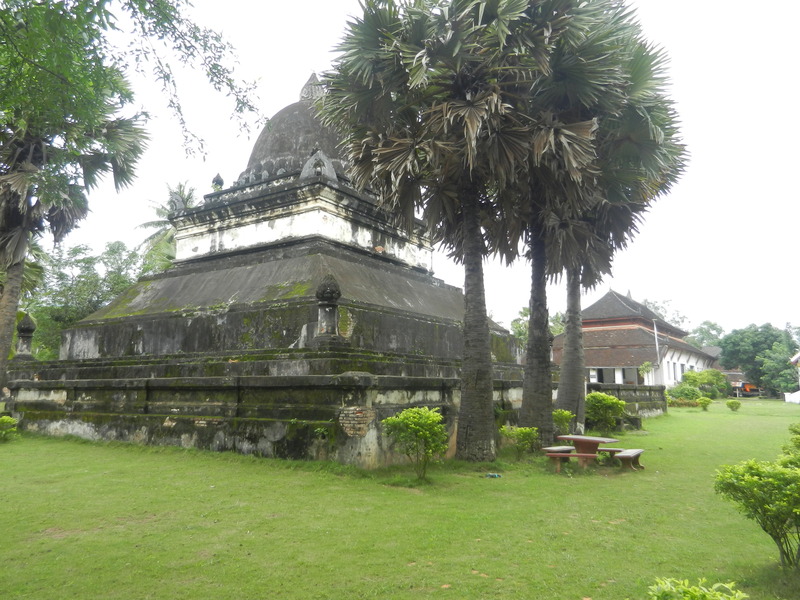 When ancient Laos’s Lan Xang kingdom strengthened itself in the early 16th century, its royal family began to build large shrines in Luang Prabang, which was the capital then. One of the first, Thakmo (pictured below), was modeled after the massive stone stupas in Sri Lanka. It surely impressed the locals, but Lan Xang had close diplomatic and commercial relations with the states in northern Thailand. It adapted the Sukhothai Buddha statue. 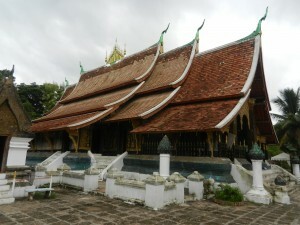 And it built monastic assembly halls in the Lan Na kingdom’s style, which was based in Chiang Mai. Luang Prabang’s Wat Xieng Thong (above), with its cascading roofs, is one of the best examples of Lan Na architecture anywhere. 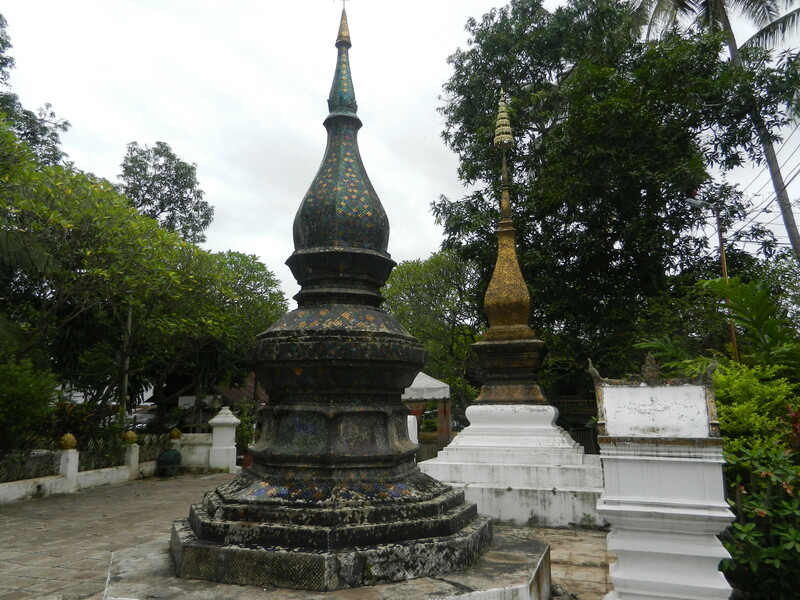 All over Thailand stupa forms were becoming more narrow, tapering and indented. 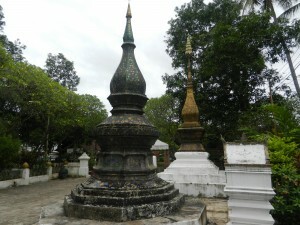 Laotians were doing the same with their shrines, including the above ones in Wat Xieng Thong. Thais and Laotians (Laotians are a Tai ethnic group, but they like to consider themselves independent from Thailand, which savagely bullied them, as we’ll see in the next post) have felt that shrines have supernatural powers. So their graceful forms seem as though nature’s power is benevolent. 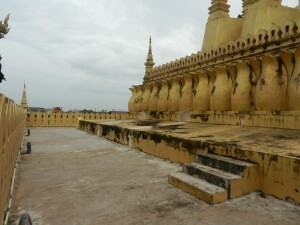 Lan Xang’s political situation intensified in the 16th century so that the kingdom needed benevolence. Burma was expanding and its troops were advancing through Thailand. Laos’s King Phothisarat and his son, King Setthathirat, moved their court down to Vientiane, which was farther from the western tiger. Smart move–the Burmese took over Lan Na without a battle and ruled it for more than 200 years, and they conquered the most powerful Thai kingdom, Ayutthaya (in the south; its capital presided about 50 miles north of modern Bangkok, which was founded in 1782). 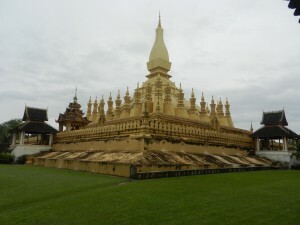 Setthathirat ordered the building of Vientiane’s Wat That Luang. 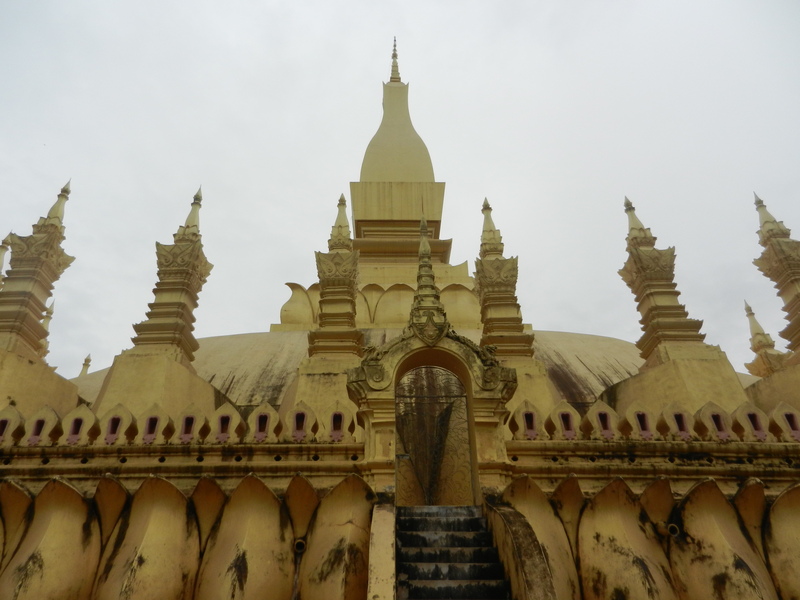 Most Thai and Lao stupas taper smoothly, as though the Buddha’s grace is cascading from the heavens. But I felt that I was in two incongruent worlds at That Luang. The Insight guide said that it’s like a fortress, and it’s easy to agree. 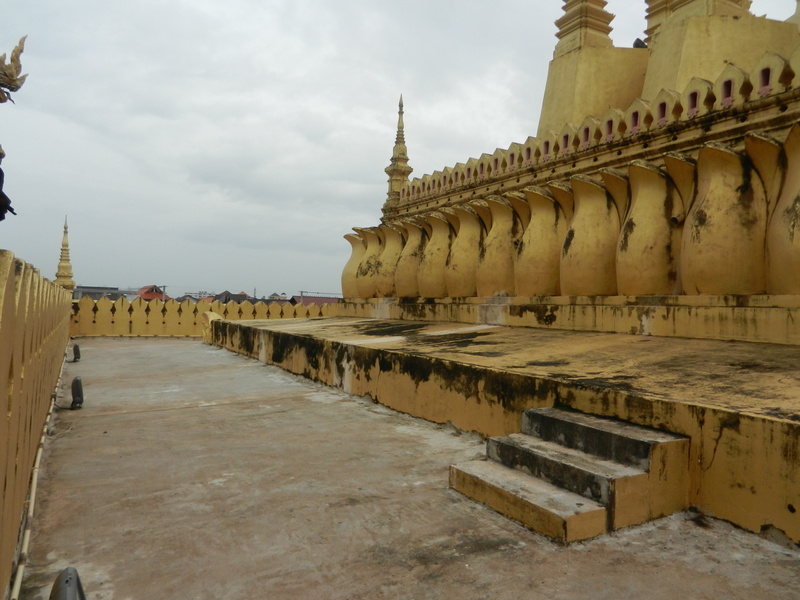 It was built on the opposite side of Vientiane from where the Mekong River flows, so its area was open to invasions from land. Maybe Lan Xang’s king thought that That Luang would give his state’s elite monks physical shelter and his capital magical protection. But Wat That Lang has an equally strong spiritual personality. Both of the above photos show a line of lotus petals along the protecting wall. Since the lotus grows from the bottom of a pond and blossoms on the water’s surface, it symbolizes purity and the soul’s liberation according to Buddhist beliefs. Its central tower and the surrounding spires rise so suddenly and sharply that they add oomph to the desire to connect with spiritual realms. The builders of That Luang seem to have had mixed feelings. The mid and late 16th century was a stressful time in Laos and Thailand. The Lao king needed to assert his dominion over Lan Xang lands. People in Laos felt that it was necessary to have the land’s spirits and the Buddha on their side in order to enjoy political security. Wat That Luang covers all bases by making strong appeals in both worldly and spiritual directions. They worked for a while. The next century was one of the best times in Laotian history. 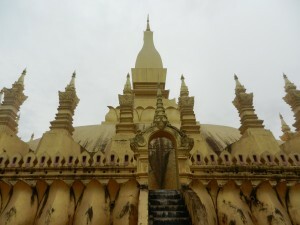 Europeans who wrote about Vientiane were very impressed. We’ll see how Laos was special in the next post, and how she fell on hard times afterwards. 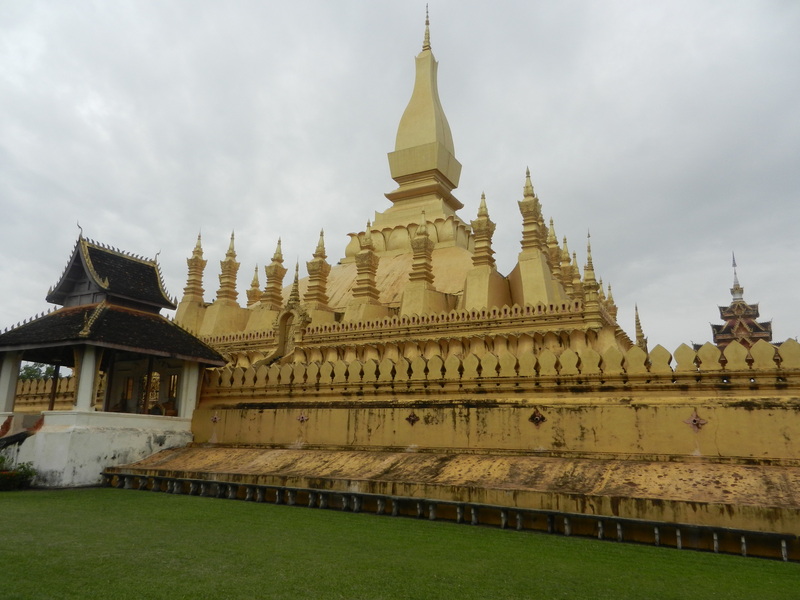 Wat That Luang still expresses reality for many Laotians.